Manchester City Women were knocked out of the Champions League, round of 32, losing 3-1 on aggregate to Atletico Madrid. 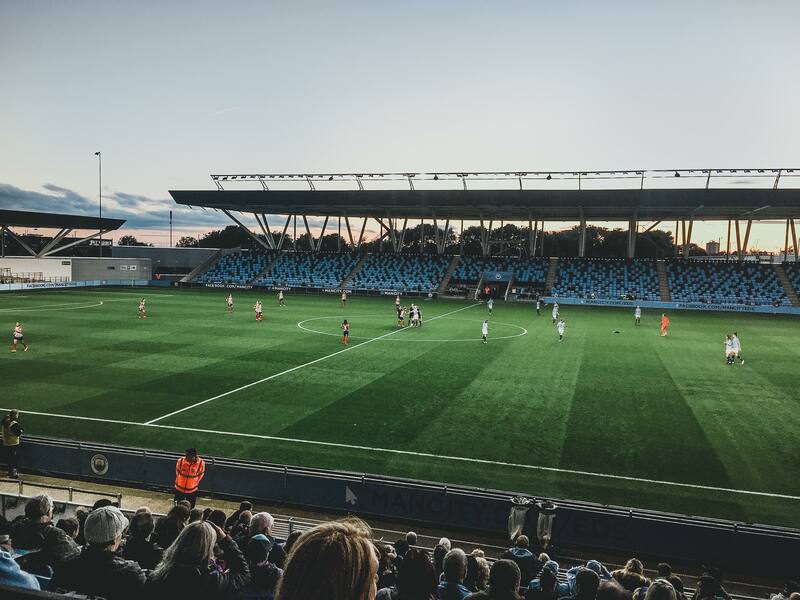 As the sun began to set behind the Academy Stadium, there was a sense of belief in the air, City kicked-off the nights proceeding’s hoping to secure their place in the draw for the last 16. Within four minutes the belief was taken a knock when Atletico, who started the game with real intensity, opened the scoring. Atletico’s Angela Sosa played through forward Ludmila Da Silva who then squared to Silvia Meseguer to put the away side in front. The perfect start. City seemed to struggle to string any passes together, especially in the middle of the park, as Atletico were always first to the ball. The home side’s best chance of the half came from a long-range effort from one of City’s standout players of the evening, Gerogia Stanway. The 19-year-old England international’s shot seemed destined for the top corner, but Atletico goalkeeper Dolores Gallardo produced the heroics to tip the ball over the bar for a corner. Spanish champions Atletico were showcasing some beautiful football at times and up top Da Silva was becoming a real handful for City’s back four. Just as the fourth official raised the board signalling three minutes of additional time, at the end of the first-half, City found themselves 2-0 down. The ball was flicked-on to find the feet of Da Silva, who drove forward on route to goal and slotted past Karen Bardsley in the City net. City players were left with their hands on their heads as they knew Atletico had all but both feet in the last 16. Nick Cushing’s side needed a miracle going into the second-half. Tessa Wullaert was introduced into the action for the start of the second 45 and gave the City boss food for thought going into Sunday’s huge league game with Birmingham. Lauren Hemp gave a valiant effort for the Sky Blues before being replaced by Nadia Nadim, due to a hamstring injury. The 18-year-old’s performance, along with Stanway’s contributions, would have impressed England boss Phil Neville who was watching on in the stands. Chances were few and far between for City, and Atletcio rarely looked in any danger. For the last two seasons City have reached the semi-finals of the Champions League competition, but it was not meant to be this time round. Nikita Parris and substitute Caroline Weir saw efforts hit the cross-bar, the latter of which was still rattling the bar as the final whistle was blown. Ultimately the two goal deficit was too much for this City side, as they leave the competition early, who can now focus of their domestic league and cup campaigns. After the game manager Nick Cushing admitted his side lacked conviction from the outset. He added: "I think giving a goal away so early and not getting into our rhythm in that first-half gave the impetus to the opposition, and in Champions League football you cannot do that." The City boss did however mention his side’s more positive second-half performance. I thought the second-half was much better. I thought we started to control the game and we started to be offensive a lot more, so the positive is we finished the game strong and we have to take that into Birmingham on Sunday. Cushing on his side being eliminated early from the competition. City, who sit third in the FA Women’s Super League, face a tough test away from home in their next fixture. Second placed Birmingham awaits City on Sunday, as Cushing’s side look to put their Champions League defeat behind them.